I’m astounded at how popular these are at parties. Don’t get me wrong — they’re tasty. But everytime I take them somewhere, they’re gone in seconds! It’s crazy! You can add a lot of different things to it – I’ve seen them with salsa, cheese, broccoli, etc — but the recipe below is my standard. – After being chilled, remove from plastic wrap, cut off the ends (and eat as you go along if you’re me! ), then slice each roll into 1″ pieces. I knew these would be fantastic — I don’t think Katie makes ANYTHING bad! 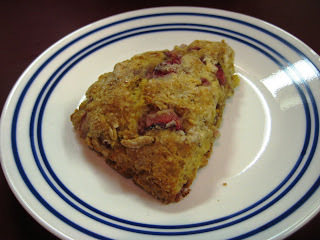 And how bad can fresh strawberries and scones be?! In college, I spent a period where I existed solely on scones and vanilla cappuchino (I can’t help it — it’s what the cafeteria was good at making!!) but shortly after college, I quit eating them. I couldn’t find anyone who made them as delicious as the college cafeteria (go figure?) and I was scared to try making them. Looks like I’m back in action! Perhaps next I’ll give blueberry/lemon ones a try — I’ve never made scones with fresh fruit! 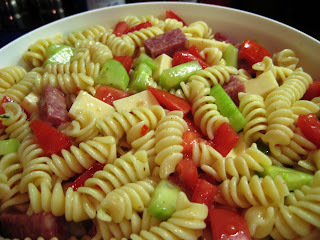 I always thought most people knew this simple pasta salad — but apparently I was wrong! I took this to a memorial day get-together, because I was super-busy and didn’t have time to make anything fancy or anything that took a lot of prep. You can add a lot of veggies to this — I just added what I had (and like). I’ll list some other common options below. This pasta salad, like many, is better the longer it sits. So make sure you prep it a few hours in advance of eating it for optimal flavor — it really doesn’t taste like ANYTHING when you first mix it! 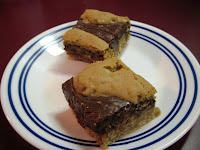 These are similar to a blondie brownie (I think? 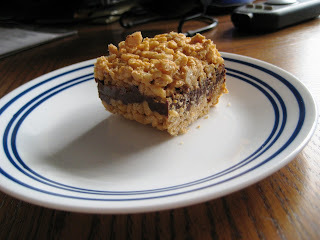 I’ve never had a blondie) with a fudge layer on top. They’re very tasty! I made them as a quick dessert for a memorial day get-together. – Bake at 350 degrees for 25 minutes, or until golden brown. These were quite tasty — they reminded me of the pan-fried pork chops and gravy my mom and grandma made while I was growing up. My changes are noted below…and I think next time I’d leave the cayenne out, or cut down the amount. Personally, I see no reason for a flash of hot spice in the back of my throat after I swallow a delicious, moist piece of pork covered in gravy. – Put the flour in a shallow pan (I used a pie plate) and add onion powder, garlic powder, cayenne, salt, and pepper. Mix it with a fork to incorporate the spices into the flour. – Pat the pork chops dry with a paper towel and then dredge in the seasoned flour, shaking off any excess. – Heat a large skillet or saute pan over medium-high heat and coat with the olive oil. -When the oil is hot, lay the pork chops in the pan in a single layer and fry for 3-4 mintes on each side until golden brown. – Remove the pork chops from the pan and add a sprinkling of the seasoned flour to the pan drippings. Mix the flour into the drippings to dissolve. – Pour the chicken broth in, and let the liquid cook down for about 5 minutes to let it reduce and thicken. 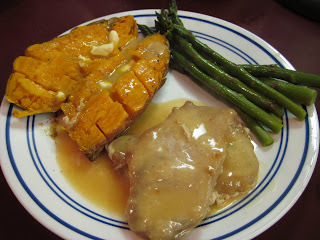 – Stir in the buttermilk (or faux buttermilk, if you’re me) to make a creamy gravy. 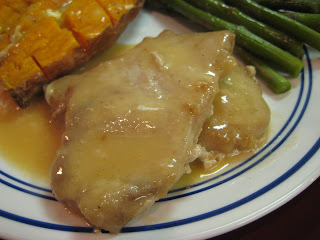 – Return the pork chops to the pan, covering them with gravy. -Simmer for 5 minutes, or until the pork is cooked through. -Garnish with parsley if preferred. 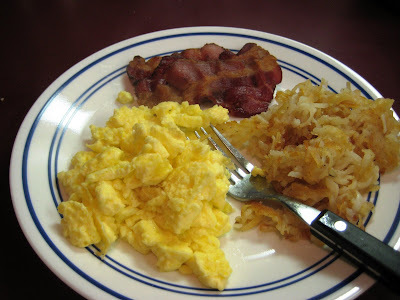 Nothing quite like a big, hearty breakfast on a late Sunday morning when it’s raining. Denny’s ain’t got nothin’ on me today! I call these rice krispies “Pittsburgh-style” because I’m from that area of the world, and when I moved away from there, I discovered not many people knew about these! Looking back, I thought these were the only kind of rice krispies for a LONG time! I love them, they’re affordable to make, and they’re easy. What more could you ask for?? – Melt the butterscotch morsels and the peanut butter in a non-stick pan over low heat, stirring occasionally. – Pour the butterscotch-peanut butter mixture over the rice krispie cereal in a bowl, mixing until completely coated. – Refrigerate your 8×8 pan with 1/2 the butterscotch rice krispies. – Melt chocolate morsels with the water over low heat in a non-stick pan. 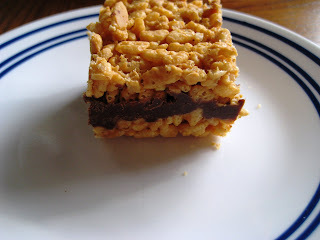 – Pull your 8×8 pan out of the refrigerator and spread the chocolate over the layer of rice krispies. – Refrigerate for 45 minutes to an hour. 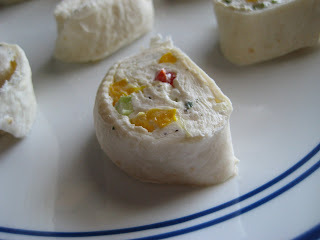 – Remove from the fridge, cut into squares, and serve. I recommend pulling them out 10 minutes or so before you serve them, so the chocolate layer isn’t rock hard. I am not Lithuanian. I’m your generic east-coast stock — Irish, Welsh, English, German. My DH, however, is Lithuanian — first generation American, to be exact. And, as with most cultures, that means he grew up eating traditional Lithuanian dishes — dishes that nobody ever bothered to write down! So this is my first attempt at a Lithuanian dish. Now, granted, they’re not hard…most of the recipes are “peasant” style recipes, consisting of starch, meat, and onion…but when the last time your DH had them was when his grandmother (perfector of the recipe) made them — well, there’s bound to be some concern that you won’t get them “right”! 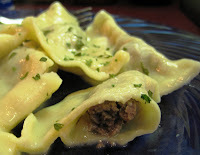 Now — education: Kulduna(Cull-doo-n-eye) are essentially meat-filled dumplings. 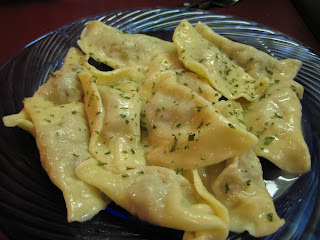 Like the Italians have their ravioli, the Lithuanians have their kuldunai. They’re, admittedly, a little labor intensive (it took me 2.5 hours to make 60 of these suckers on my own) — but they are pretty tasty for a simple dish. 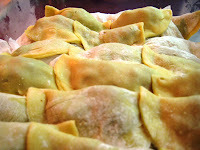 And next time, DH will roll out all that pasta dough by hand, and I’ll just do the filling – he’s been informed of such. – Mix filling ingredients well (like mixing meatloaf) and set aside while you make the dough. – Remove the dough from the fridge and the saran wrap and transfer it to a floured work surface. 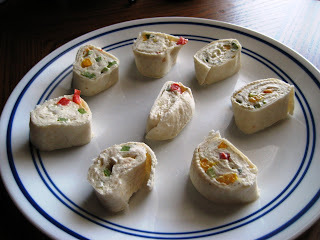 You may want to break the dough into two pieces to make it easier to roll out. – Using a rolling pin, begin rolling it out — flipping it occasionally — until you’ve reached 1/8″ thickness (like a piece of cardstock, for example). They don’t photograph well — they’re to be served tossed in butter, so there’s no sauce, per se — but you get the idea. 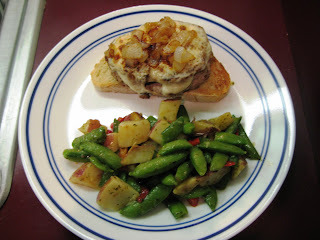 I received this recipe in a cooking e-mail list I belong to, and DH approved it for trying. It was tasty, but a lacking a bit on flavor. I added some garlic to the mix to help it, but feel free to add any of your usual turkey burger ingredients to it — it needs some kick! All-in-all I’d make it again…it WAS tasty! – Combine ricotta cheese, worchestershire, black pepper, minced garlic, turney breast and egg white. – Return pan to medium heat, and coat pan with cooking spray. – Add patties to the pan, cook approx 4-6 minutes or until brown. Turn patties over, cook until center is cooked through. – Top each patty with 1 cheese slice; cook 2 minutes or until cheese melts and patties are done. – Places bread slices in a single layer on a baking sheet and broil for 2 minutes or until toasted. 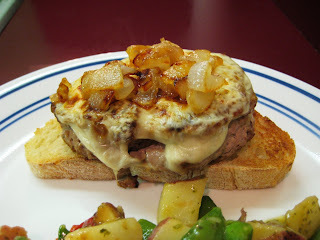 – Spread 1 tablespoon of mustard on each toast slice, then top each with 1 patty. We served it simply, with a veggie medley. My other pretzel recipe was Alton Brown’s — and it was really good. But this recipe is a bit quicker to make, it had brown sugar (which I hoped meant a sweeter pretzel), and it gets raves on the cooking message board I frequent. While I don’t think it was much sweeter than Alton’s, I do think it was quite tasty. I’d make either one, but I think I prefer this one because it has a slightly less “yeasty” flavor. The only thing I added to Amber’s recipe was a light egg wash before baking the pretzels, so they’d come out nice and dark brown and a bit crisp on top. – In a large bowl, mix together 1/8 cup hot water and 1 package active dry yeast until the yeast dissolves. – Stir in the 1 1/3 cup warm water and 1/3 cup brown sugar and continue stirring until the brown sugar dissolves. 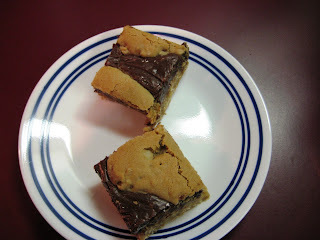 -Grease your cookie sheets (I used 2) generously with butter or shortening. It is very important that you grease the cookie sheets well! – Sprinkle greased cookie sheets with kosher salt. – Preheat oven to 475 degrees Farenheit. -Using a liquid measuring cup, fill a large saucepan at least 1/2 full of water. For each 1 cup of water you add, add 1 tablespoon of baking soda. – Bring the water and baking soda in the saucepan to a gentle boil. – Using a pancake turner, or a large spatula, gently lower each pretzel into the water one-by-one — counting slowly to 30 before removing the pretzel from the water and placing it on the cookie sheet. – Repeat until all pretzels are done. – When all pretzels have been boiled, lightly brush each pretzel with the egg+1 tbsp water mixture, then sprinkle with more kosher salt. – Bake for 8 minutes, or until the pretzels are golden. – I baked half my pretzels with no salt, and when they came out of the oven, dipped them in melted butter and cinnamon-sugar mixture to make cinnamon sugar pretzels. YUM!